« BibleNewsProphecy: How many genders did God create? Back in October 2018, US President Donald Trump announced that the US planned to pull out of the Intermediate-Range Nuclear Forces Treaty signed by Russia and the US in 1987 (see Donald Trump to cancel intermediate-range nuclear treaty–Russia issues warning). On February 1, 2019, his administration basically made that official, which upset the Europeans (see ‘Europeans aghast as end to INF treaty looms’). It was partially because of Donald Trump’s statements on the INF treaty that seemed to trigger statements from French President Macron and German Chancellor Merkel about the need for a European army in late 2018. Europe was already working on this, but President Trump’s comments gave the supporters more reason to publicly push for it. Here is a link to the sermonette video: PESCO and a Great European Army. Will Russia’s ‘Satan 2’ destroy Texas or France? 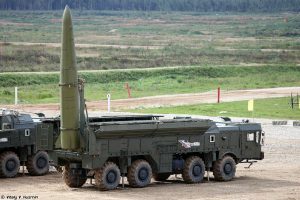 In late October 2016, Russia revealed its RS-28 Sarmat thermonuclear-armed ballistic missile. It has been dubbed as ‘Satan 2’ by the North Atlantic Treaty Organization (NATO). It supposedly has the power to destroy an area the size of the State of Texas or the nation of France. Could it ever possibly be used to destroy either of those areas? What does the Bible say? What do Bible prophecies say about Europe, the USA, and Russia in the end times? Which power does the Bible teach will be made ‘a desolation’ by a Russian-led confederation? Could Satan 2 possibly be used? Dr. Thiel answers these questions and more. Here is a link to our video: Will Russia’s ‘Satan 2’ destroy Texas or France? Despite temporary support of the EU by Russia, it is possible that something like this could be used one day to eliminate parts of Europe, such as France (see also The ‘Lost Tribe’ of Reuben: France in Prophecy?). Russia has a lot of military power. People who are trusting in Donald Trump and/or the US military, instead of looking to trust God and striving to be in His Kingdom, are deceiving themselves. Europe rearmament is an “unintended consequence” of some of Donald Trump’s positions and actions. Before going further, let me state that Bible prophecy does NOT show that Russia will be the lead military power to destroy the USA–according to scripture that will be Europe (cf. Daniel 11:39; Revelation 13:1-4). Also, let me state that contrary to the view of various Protestant prophecy commentators, the prophecies involving Russia in Ezekiel 38 are NOT for this time. Ezekiel 38 is for the distant future–and right at/after the millennium (cf. Revelation 20:7-9; see also Ezekiel 38: For Russia & Iran in Our Day? ; a related video is also available titled Ezekiel 38: For Russia, Ukraine, & Iran Now?). But that does not mean that there cannot be military conflict between the USA and Russia now (and there is likely to be some). But what about massive destruction with ties to Russia? That will come. Europe will one day be hit. But this is at least seven years away (for some biblical reasons, see When Will the Great Tribulation Begin?). Could the USA be hit by ‘Satan 2,’ ‘Poseidon,’ ‘Avengard,’ or some similar weapon? It is possible that Russia would share its technology with Europe, give various weapons to the Beast of the Sea (Revelation 13:1-10), and/or launch one or more against the USA itself. Or Europe may get some ideas from the Avengard, Poseidon, and ‘Satan 2’ programs to prepare their own superweapons. Ezekiel 38 is for the distant future–after the millennium (cf. Revelation 20:7-9; see also Ezekiel 38: For Russia & Iran in Our Day? ; a related video is also available titled Ezekiel 38: For Russia, Ukraine, & Iran Now?). But that does not mean that there cannot be military conflict between the USA and Russia now (and there may be some). Yes, I, too, expect that Russia will make a deal with the Europeans. Because of military and political considerations, the European King of the North might be inclined to give Russia all or parts of Alaska as well as possibly parts of Canada, as well as some people from those lands. The strongest fortresses in the world belong to the USA and to a much lesser extent, its English-speaking allies (for a more detailed explanation of why the USA and its Anglo-allies are involved, as well as the dividing of their lands, please see Anglo – America in Prophecy & the Lost Tribes of Israel). Some would call this attack World War III (WWIII). The “he” mentioned in Daniel 11 is the European King of the North, who is also the Beast of the Sea in Daniel 7 and Revelation 13. Now, did you notice that ‘he’ divides the land of the place with the strongest military for gain? Although Russia sold Alaska to the United States in the 1800s, there have been reports that it wants it back (for details, see Russia and Ukraine: Their Origins and Prophesied Future). While the ‘land of the north’ has to do with end time Babylonian Europe (cf. Zechariah 2:6-7), the “end of the earth” comment indicates that Russia will also have been involved. Some of the descendants of Jacob, which includes the Anglo-American nations (see Anglo – America in Prophecy & the Lost Tribes of Israel), will end up in the “ends of the earth” (this includes Russia, cf. Jeremiah 50:41) and will later be freed as Jeremiah 31 points to. The Bible is clear that Russia will be a significant military power in the end and will cause fear (Daniel 11:44-45; Jeremiah 50:41-43; again to see more details, see Russia and Ukraine: Their Origins and Prophesied Future). A recent headline was “Is Trump Pushing Germany to Russia?” There have been comments by German and Russian leaders that they have aligned interests that Donald Trump opposes and need to take financial, military, and other steps to assist Europe. Russia and the EU (European Union) still support the Iran nuclear deal, Paris Climate accords, and the World Trade Organization, despite Donald Trump’s actions against them. Have there been comments to replace the USA’s SWIFT system by the Russians and Germans? What is Russia’s MIR payment system? What about talks for the EU to have trade and other arrangements with the EAEU (Eurasian Economic Union)? Did the old Radio Church of God foretell of the development of a Russian and German plan to eliminate the USA? Has Russia indicated that it wants Alaska back? Is the giving of USA territories to Russia by a coming European leader consistent with a prophecy in the Book of Daniel? Here is a link to our video: Is Donald Trump pushing Europe to Russia? The USA is pushing Europe (including Germany) away from itself and towards Russia. Irrespective of what happens with the INF deal (it could be renegotiated), a deal between Europe and Russia will happen and it will NOT end well for the USA (Daniel 11:39) nor for its British descended allies (Daniel 8:24-25). Can You Prove that the Beast to Come is European? The Book of Revelation tells of a beast power that will rise up. Some think that this must be Russia or could be Islamic, while others say that this power is European. The Book of Daniel tells of the rise of an end time King of the North that some think must be referring to a Does God Have a 6,000 Year Plan? What Year Does the 6,000 Years End? Was a 6000 year time allowed for humans to rule followed by a literal thousand year reign of Christ on Earth taught by the early Christians? Does God have 7,000 year plan? What year may the six thousand years of human rule end? When will Jesus return? 2027 or 20xx? There is also a video titled 6000 Years: When will God’s Kingdom Come? Here is a link to the article in Spanish: ¿Tiene Dios un plan de 6,000 años? Donald Trump and America’s Apocalypse-Kindle Edition This electronic version of the 188 page print edition is available for only US$3.99. And you do not need an actual Kindle device to read it. Why? Amazon will allow you to download it to almost any device: Please click HERE to download one of Amazon s Free Reader Apps. After you go to for your free Kindle reader and then go to Donald Trump and America’s Apocalypse-Kindle Edition.ng he wrote back in 2008 that the Trump presidency is also helping lead to fulfillment. Should you trust Bible prophecy or not? Dr. Thiel says that Bible prophecy can be trusted, despite the view of skeptics and others that either overlook or despise the Bible. This is a video. This entry was posted on Sunday, April 14th, 2019 at 7:45 am	and is filed under Prophecy. USA successfully shoots down a missile with a missile, but . . .